I've had a Squier VM jag for a couple of months. Very pleased with it but with one problem. When playing, and more noticeably with medium to high gain, there is an intermittent crackling sound which stops when I touch any of the control plates but not when I touch the bridge or tailpiece. from this I assume it's a ground problem. The bridge has what I take to be a ground wire - I can see the end where it is soldered to the pot but haven't a clue as to where the other end is anchored. I looked below the tailpiece and there is no ground wire or shielding paint there. So I hooked a wire from one mounting screw on the tailpiece to a mounting screw on the control plate and the crackling disappeared. Sort of Eureka as I can't see way of drilling a hole between the respective cavities as the clearances are way too tight for my drills. I am puzzled as I would have thought that the tailpiece would ground through the strings to the Bridge and also don't understand why the crackling doesn't go when I touch the bridge even though my multimeter shows there is a ground to the control plate. Any ideas on 1) Is there is something I can do at the bridge to help (how do I get to see the ground wire) and 2) How to run a wire between the tail piece and the control plate without extensive butchery - best idea so far is to drill holes from the cavities to the back of the body and rout a thin groove and cover it with a plastic strip. I am thinking of changing the bridge to a Staytrem so if butchery is needed I might wait until I've done this and see if it makes any difference. Maybe its not a ground problem - perhaps static and grounding the tailpieces discharges it? Dunno! BTW the problem occurs on different amps, effect units going directly into a PA, and at different venues so it is definitely at the guitar end. Is the ground from under the guard to the bridge cup there? There isn't a wire as in your photo, which I guess is a jazzer. However, there is a wire connected to ground on a control pot that disappears into a hole drilled from the control cavity in the direction of the bridge. I don't know if it is connected there but it does seem likely as the bridge shows a path to ground on the multimeter. I'm not sure how to get at it to check if it is a good connection. I think I'll hook a wire around the bridge posts to the control plate and see if that does the job. If that does then it would suggest that the bridge is making an intermittent or bad contact with the bridge cups. I'll also resolder the connection to the pot. I remember my CIJ had a ground wire going to the tailpiece, but it was just kept in place by being SMOOSHED between the plate and the lip of the route. One day it broke off and the Jag got mad buzzy until I sussed it. Maybe you're having the same issue? 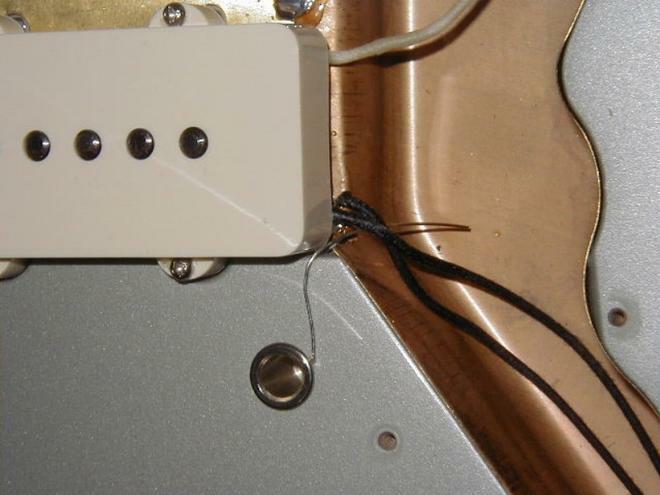 Thanks for the reply - I think it may be a similar problem and I may have to perform some surgery to run a ground wire from the tailpiece to the control cavity. However, I hooked a wire from a bridge saddle to the control plate and the crackling disappeared. Looked like the bridge was not grounded properly. I also found that the crackling appeared when I used the Trem ( I use the arm all the time and unconsciously so I hadn't noticed before). Got out the multimeter and checked the bridge to ground in just about every conceivable usage and noted that the path to ground seemed to vary in resistance. Thought about this a bit and wondered whether the posts were making contact with the cups or the adjust screws with the base of the cups. The bridge was basically down on the guard as the action was fine from purchase - very low with no fret buzz. So I adjusted the screws until the bridge just lifted i.e. they were definitely touching the cup base and on a quick test the crackling has stopped - but I want to do more checking on higher gain. I'll post the results as I know someone else who has a similar problem on a Jag. However, there is a wire connected to ground on a control pot that disappears into a hole drilled from the control cavity in the direction of the bridge. I don't know if it is connected there but it does seem likely as the bridge shows a path to ground on the multimeter. Yeah, I think most of the modern Jags that aren't AV or CIJ / MIJ use this method. It likely goes into the hole for the thimble. This as opposed to running the wire over the top of the body like in Thomas' pic. I have a Jag built from a VM body so I'll take a look at mine tonight. Also, if it's intermittent crackling and not just constant hum, it's possible you have a failing pot. The ones they come with aren't awful but they're not the greatest either. Many thanks to all who replied. This is a great and helpful forum and I log in every day. Checked things out again this morning using high gain. Screwing in the bridge adjustment screws seem to have solved the problem at least for now. If it comes back again I'll drill through the tailpiece and control cavities and cut a groove in the back to run a ground wire - probably cover it with a plastic plate. As far as the grounding problem with the bridge is concerned I noticed with the earlier checks that with the probes on the chrome the resistance fluctuated but improved when I pressed hard (bottoming on the cups perhaps?). Given that ensuring that the adjustment screws touched the base of the cups sorted the crackling it looks like the chrome is not as conductive as one would expect. Maybe they are still covered by some sort of release agent/preservative from the manufacturing process or it could simply be that the clearances between the posts and the cups necessary for the bridge to rock is the reason. I don't really like the bridge cup method. I don't think it's the most reliable way. The bridge might move in normal use, resulting in intermittent conduction, and if you use things like electrical tape or a Staytrem with sleeves whatever, who knows if the connection is solid. Regardless, the connection is just through the tips of chrome plated bridge height screws, not particularly solid IMO. I much prefer a wire to the tailpiece. If you have a very long drill bit, you can drill one for yourself. I highly recommend it. You drill from the tailpiece route to the control plate and then the ground wire is really clamped in there. Sand off a bit of plating under the tailpiece where the wire touches and tin the wire so it doesn't fray. This is a rock solid connection. If I get my hands on a long enough drill I'll ground the tailpiece - with care! Yes. That's why you want a really long bit. At least a foot long, so you can angle the bit shallow. Work nice and slow, don't push it, let the sharp spinning bit do the work. And as added help they are sometimes known as "Aircraft" bits. I have one I use for exactly this sort of thing (well, that and drilling holes to run wires between the pickup cavities on a rear-routed guitar. Many thanks - I'll see if I can get my hands on one. i found one on Amazon for cheap. i did exactly what yall are talking about on my squier JM. Worked really well.